The video is still rolling. Randy just said “it is coming in 2011. It’s coming on Xbox 360, PS3 and PC – it’s coming out on everything”. So, 2011 confirmed? The camera is still rolling… They’re leaving the presentation. Aw, well that was nearly good. Ooh, they’re now filming some gameplay footage. There’s a guy running around a big open level outside on some desert looking planet…he has a big sniper rifle… he shot an alien. Those are actually pretty nice graphics. They seem to be playing it on the 360. Ooh a nice waterfall. And some trees. It looks a bit like Borderlands. Is that a minecart track? Ah theres a big wooden bridge strucure over a canyon next to the waterfall, and the – a spaceship! A big alien ship just flew overhead and landed out of sight. I think aliens are coming out of it… Ooh someone else is driving a truck! The camera has gone into third person view while hes driving down a chasm. Seems to be some radioactive barrel in the boot. Holy crap! I just saw what looked like the big Portal Storm from HL2 Episode 2 in the distance! So, this is pretty exciting news. 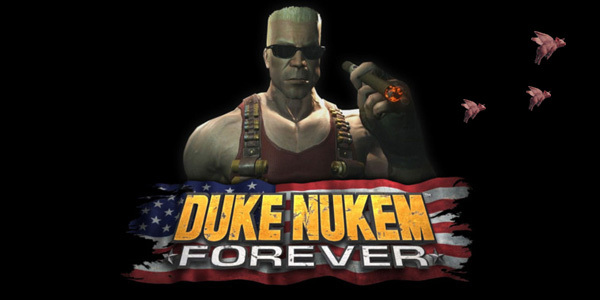 The game that redefined ‘development hell’ by failing to get released even 13 years after it was announced, then cancelled, then forced the previous development studio to close down altogether, not to mention be the cause of several messy lawsuits and the biggest joke on the internet…Duke Nukem Forever rises again. Well I’m gonna end this here, the stream is not that good quality and no doubt there’ll be some high quality videos released over the next few days, so we can look forward to that. I never actually played the original Duke Nukem games, aside from the remake that was out on the 360 Arcade, I tried the demo of that… It’s a classic series though, so no doubt many people will be pleased with this news. The story of Duke Nukem Forever’s development is something I find totally hilarious – god knows how good the finished game will be after all these years, but it’s bound to be worth checking out when it’s finally released. She was just interviewing another guy and he mentioned there will probably be multiplayer. This is good news, I suppose. I wish I cared more about this game, I’m mostly just enjoying the drama. I don’t think I can be arsed with any more of this. Hoorayness for the Duke. This entry was posted in News and tagged duke nukem forever, gearbox. Bookmark the permalink.